Nice - thanks for posting the pics! 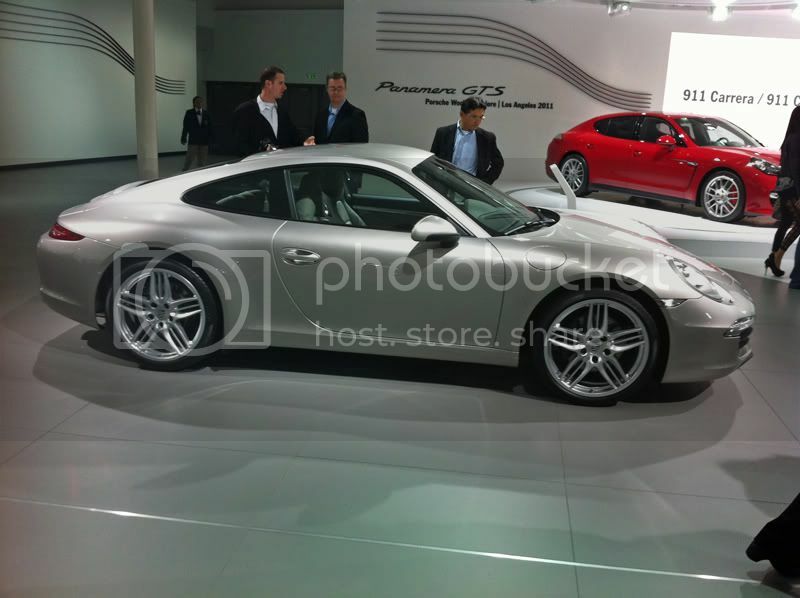 What are your impressions of the 991 after seeing it in person? One of the magazines pointed out the longer wheelbase can be seen in the area behind the door to the rear wheel. Does it look much bigger in person when compared to a 997? Rather than maintaining it's beloved rear engine sports car roots, over the years the standard Carrera body style has more and more evolved into a gran turismo . At some point, it's going to start looking like a sedan . In the future, I wish that Porsche would revisit the design of the 993 . I agree, and many others probably do too. I believe each newer, bigger 911 series (996, 997, 991) will continue to do better and better sales wise in China & India, not to mention in the US and other countries, and Porsche will never look back. The only hope is they may some day decide to do a baby 911 (like which has been rumored for the Boxster) in addition to the fat boy 911. The baby 911 could more closely resemble the dimensions and great looks of the 993. They can leave out the back seats. you can see the added length/wheelbase in the rear of the car....can't say I like it. Hard to put your finger on it, but there is something "aston" looking about the rear of the car....the hips are just not as attractive as the 993 and 997's. Does the new carrera S have a wider body over the base carrera like the 997 series? Does the new carrera S have a wider body over the base carrera like the 997 series? I don't know about a wider body on the 991. 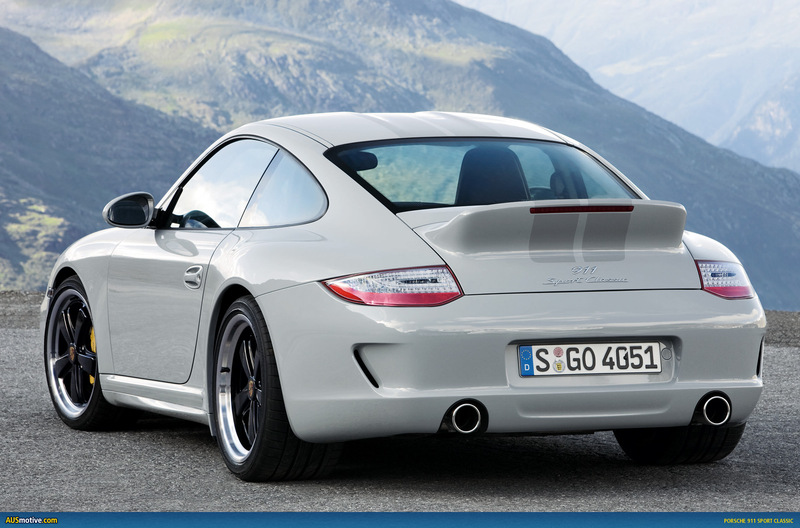 I knew there was a wider body for the 997, but I thought you had to get a 4 or 4S (all wheel drive) to get it. Last edited by ddb; 11-18-2011 at 08:28 AM. In the 997, the Carrera has the narrowest body. The CS and C4 have the same body, and the C4S is wider still. Not sure where the turbo and GTs fit into the mix. The ironic thing to me is that in the day, the 928 was considered a Luxurious GT but if you jump directly from a 928 to a 997 (with sport chrono plus I might add), the 928 (at least the 5-speed stick S4 version) feels more raw and connected. The 991 is supposed to be even more numbed from the articles coming out now in Car&Driver and Road&Track. It's too bad, but it's what the market demands if Porsche is to sell more and more 911s every year. Instead of replacing the 911 with the 928, as was the plan, the 911 has just become the 928. Instead of replacing the 911 with the 928, as was the plan, the 911 has just become the 928. I think you could put the current flat 6 engine, Porsche V8, or V6 in the front of the 991 and basically have a 928 (water cooled, front engine, GT layout). True Porschefiles may have a problem with calling it a 911, but as long as it had the 911 name and general shape, the general buying public wouldn't care. I just looked on the Porsche website and they list the 991 Carrera and Carrera S as the same width. These are the only two variants currently listed. Oddly enough, in the 997 series, the website lists the Carrera Cabriolet, Carrera S Cabriolet, Carrera 4 Cabriolet, and Carrera 4S Cabriolet all having the same width. According to their website specifications, you need a Carrera GTS Cabriolet to get a wider body, which they list as equal in width to the Carrera 4 GTS Cabriolet, Turbo Cabriolet, & Turbo S Cabriolet. I've read conflicting information on the widths elsewhere, so I'm confused. You can see the difference by looking at the cars themselves. The tail lights are the same part and spacing for all cars. They are flush with the side of a standard Carrera. On the wider cars, the fenders bulge from the tail lights so they are not flush. This is the best picture I could find to show the bulge. It's a flat spot in the bumper along the outer edge of the tail light. I love that car in your link! I've just seen some other examples online from straight behind and you can indeed see the difference with the tail light being flush with the sides on a narrow body versus not being flush with the wide body. Look at the width specifications from a 997.2 owner's manual. It is totally different from what's listed on the Porsche website. That's not right either, because if you go and look at a C4 and a C4S, they are clearly different from each other. My impressions of the 991 in person are that it looks better in person than in pictures. The design elements are subtle but significant and very well done. Biggest negative for me is the mostly carry over Panamera interior - the 991 should have got its own unique design. Ratheir than maintaining it's beloved rear engine sports car roots, over the years the standard Carrera body style has more and more evolved into a gran turismo . At some point, it's going to start looking like a sedan . In the future, I wish that Porsche would revisit the design of the 993 . 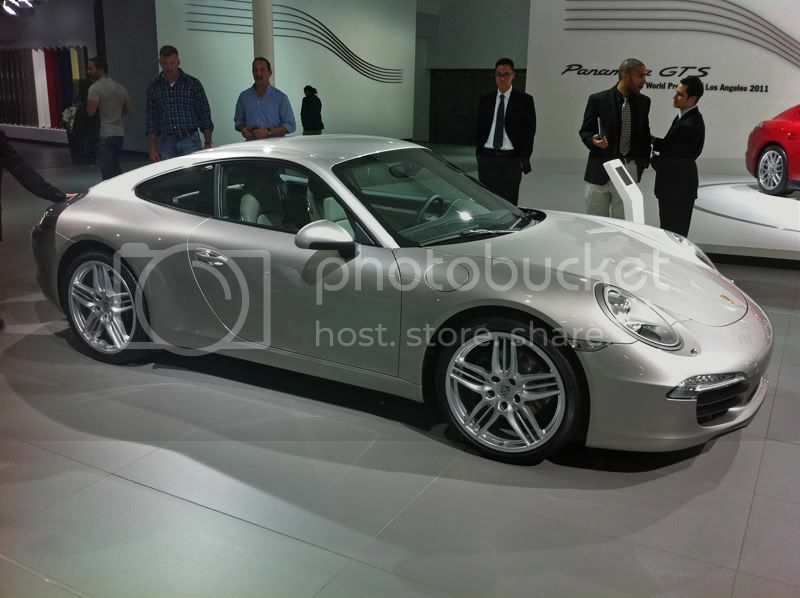 +1 , Porsche is making their cars bigger,heavier and ride more like a GT car then a true sports car. I really like the 991 Cabriolet pictures and videos that have been popping up recently. IMO it is the best looking 911 Cabriolet ever. I didn't like the stacked look of the lowered top on the earlier Cabriolets and something didn't sit right about the later models with the top down. I agree with the bigger, heavier, more GT-like sentiments, but I feel like Porsche has a winner with this platform and will continue with it accordingly. ddb - ya I was just looking at the New Cab, it is on the Porsche site. The big ugly hump in the back is smaller, much nicer looking. about the same (maybe less?) than the outgoing 997 series? The big ugly hump in the back is smaller, much nicer looking. Careful what you say, some of us like our porsches like we like our women. With big rear ends Haha couldn't resist. I get the feeling you've been spending a bit too much time with Johnny Danger. I do like that they finally found a way to keep the shape of the solid car's roofline essentially intact on the new cabriolets. It blends much better. The funny thing is I've yet to see a picture of the new one with the top down. Yes the new rag top looks great, the lines are wonderful. 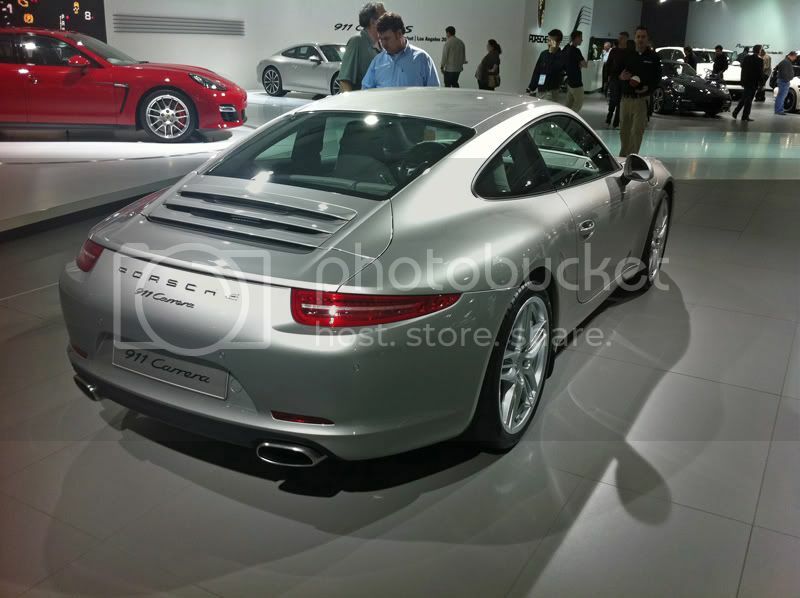 Checkout porscheusa.com, galleries with and without the top up. It does look nice, the hump is still there, just refined, I'd say. Nice profile to the car. Is the top really partially solid like I was reading about in the rumor mill leading up to the car's release?